Compact fluorescent lights (CFLs) are four times more efficient than traditional light bulbs. They can last up to ten times longer than other bulbs, often going for years without needing to be changed. While initially more expensive, over time, CFLs save you money because they do not need to be replaced often and they use less energy for the same level of brightness you're used to from other lights. Additionally, the light from CFLs is more appealing. While traditional fluorescent lights are harsh and can feel irritating to the eyes, CFLs give off a warmer, softer glow without sacrificing brightness or clarity. For those in an office setting, switching to CFLs can make the workday much more pleasant. Twin Tube Lamps: A CFL that has two parallel tubes are called Twin Tube Lamps. They are designed to fit into lamps, task lights, recessed ceiling lights and wall lights. This type of lamp bulb is also called a "Biax" or "Dulux" lamp. These lights are often used in homes and small businesses. Quad Tube Lamps: Quad Tube Lamps give nearly the same light output as twin-tube CFLs of equivalent wattage. They are only half the length, however. This type of bulb fits better in smaller lamps and similar applications. They are also known as "Double Biax," "PL Clusters" or "PLC" lamps. They are a good choice for tight spaces. Triple Biax Lamps: These CFLs generate even more light in a shorter bulb. Because they provide a high amount light output from a bulb that takes up a very small amount of space they are commonly used in fixtures designed for incandescent bulbs, such as table lamps. Spiral Lamps: The shape of a spiral lamp is a continuous tube in a spiral shape. 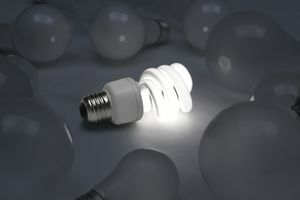 The similarity in shape and light casting qualities to a standard incandescent bulb make this the most popular model of a compact fluorescent lightbulb. This is one of the most common forms, typically used in residential homes in lamps. F Lamps: F lamps have two twin tubes, aligned top to bottom instead of side to side like a Quad tube making the shape of the bulb resemble an F. This type of CFL is commonly used for task lights and low profile recessed fixtures. Circular (Circline) Lamps: Circular lamps were designed for reading lamps and other lamps which use a circular light. There are some individual brands that give the "cool white" light found in a typical fluorescent. Other circlines available, however, have electronic ballasts and give warm light, so it is important to make sure you buy the right CFL for what you are lighting. Regardless of which type you use, any CFL will give you more efficient, versatile, and cost-effective light than any traditional light bulb. Switching to CFLs can be an improvement to your business or home.